You will notice that a lot of my sample tags for my tutorials have some animated "noise" in them. Instead of detailing on each tutorial how to add the noise to the tags I have done up this tutorial for you to reference to if you would like to learn how to do it. Once you understand how to use the DSB Flux Filter to add noise then you can add noise to any part of a tag you like in the future. The principal is the same each time you use it. We will be using the Bubbles & Bright Noise effects. I use The DSB Filter all the time to "add noise" to a tag. You can use the "Bright Noise" filter to do that. Just another option instead of using the "Add Noise" option in PSP. There are MANY filters in the DSB Flux filter set, and I've only chosen 2 out of the set for the quick little tag that you see below. If you'd like to try what I did you can follow the short tutorial below. 4. 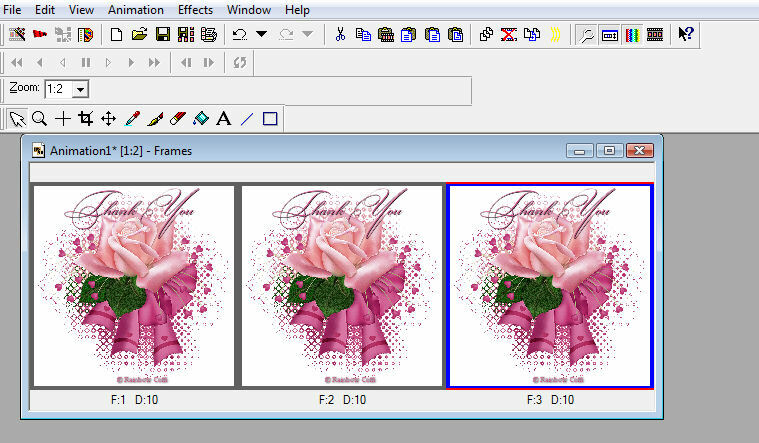 Right Click on your tube and "copy" then go back to your 400x400 image, right click and "paste as a new layer"
5. Right click on your tube layer and duplicate 3 times. You should now have 4 layers of your tube. I like to rename my layers as it makes it easier. On Raster 1 layer I renamed it to "Bubbles layer" On Copy of Raster 1 I renamed it to "Noise 1" On Copy (2) of Raster 1 I renamed it to "Noise 2" On Copy (3) of Raster 1 I renamed it to "Noise 3"
6. Click on Bubbles Layer to activate it. Go to your DSB Flux filter set and choose "Bubbles" I used the default settings of Bubbles 45, Density 50, Frequency 50, Tune 50. 7. Next I wanted to add noise to only the green leaves. Click on your "Noise 1 layer" to activate it. Mode ~Add, Match Mode~ RGB, Tolerance~28, and Feather~1. Click inside the green leaves and you should see the marching ants around only the leaves. Still on "Noise 1 layer" go to your DSB Flux filters and choose "Bright Noise" with the settings of Intensity 25 and mix checked. Click on "mix" 1 time. 8. Activate your "Noise 2 layer" by clicking on it. Go to your "Bright Noise" filter again and click on the "mix" 2 times. 9. Activate your "Noise 3 layer" by clicking on it. Go to your "Bright Noise" filter again and click on the "mix" 3 times. 10. 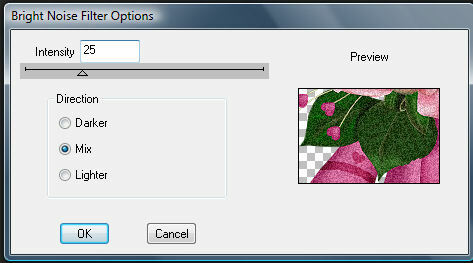 Now "Selections, None" or "Ctrl D" to deselect the marching ants around your leaves. 11. 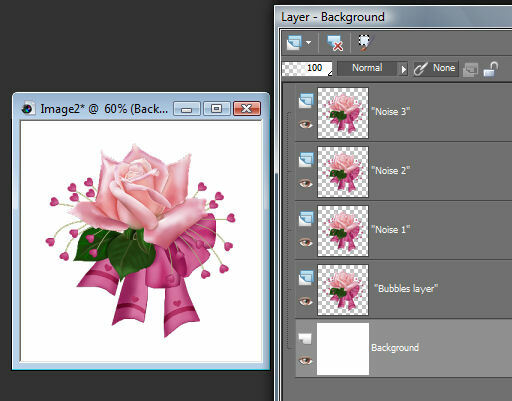 Hide your "Noise 2 and 3" layers by clicking on the eye to the left of the layer. 12. Add your copyright information and your name or text. I added the "thank you" to my tag but this is optional. 13. 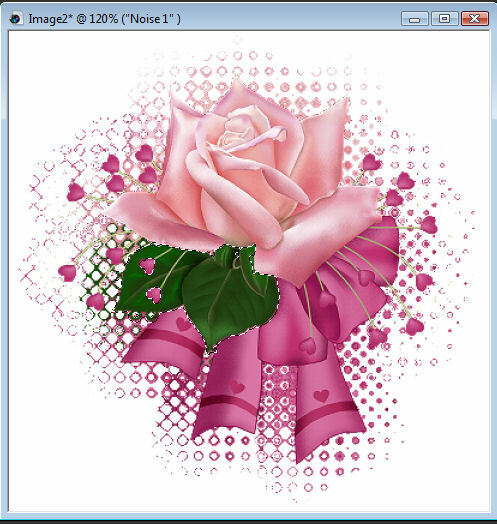 Click on your "Noise 1" layer to activate it. Right click on your image and "copy merged"
14. Got to Animation shop and "paste as a new image"
15. Go back to PSP hide your "Noise 1 layer" by clicking on the eye. 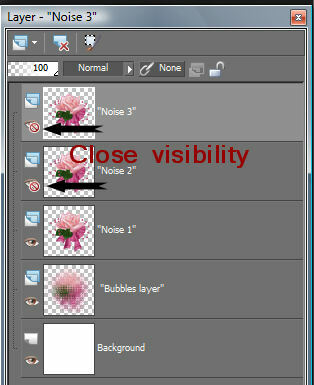 Go to your "Noise 2 layer" click on it and unhide it by clicking on the eye. Go to your image and right click "copy merged"
16. Go back to Animation Shop and "Edit, Paste after current frame"
17. Go back to PSP hide your "Noise 2 layer" by clicking on the eye. Go to your "Noise 3 layer" click on it and unhide it by clicking on the eye. Go to your image and right click "copy merged"
18. Go back to Animation Shop and "Edit, Paste after current frame"
19. You can now view the animation by Choosing "View" then "animation. If you like how it looks you can now save. There you go ALL DONE. That is how you can use the DSB Flux Filter to create some "noise" in your animation. You can use these same principals on any part of a tag you do. Use your magic wand tool to select the area, Duplicate that layer 3 times, then go to your DSB Flux filter and add noise to each layer. 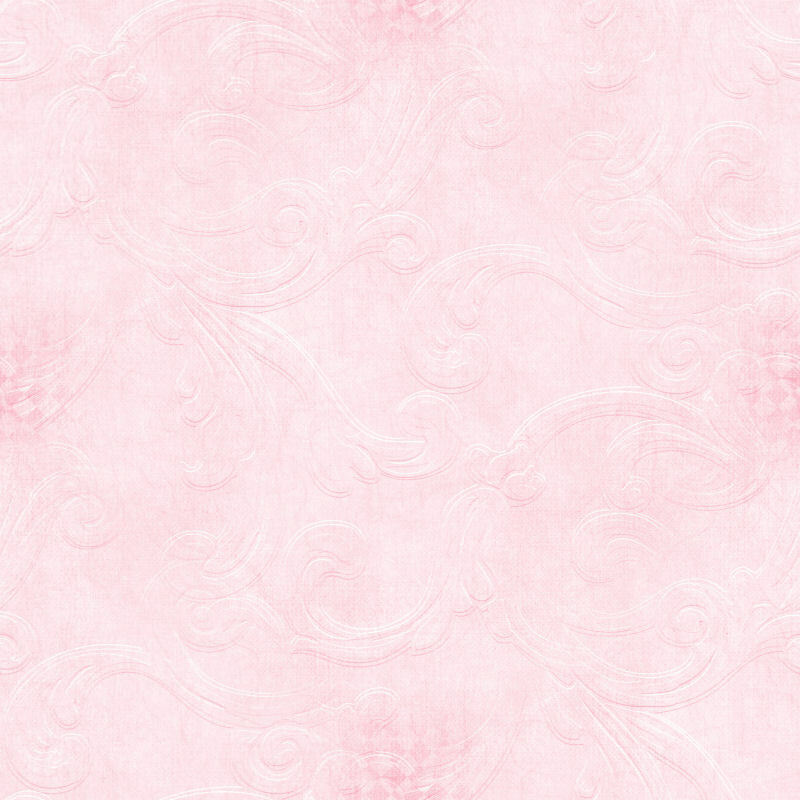 This tutorial was written by Ladyhawwk Designs. 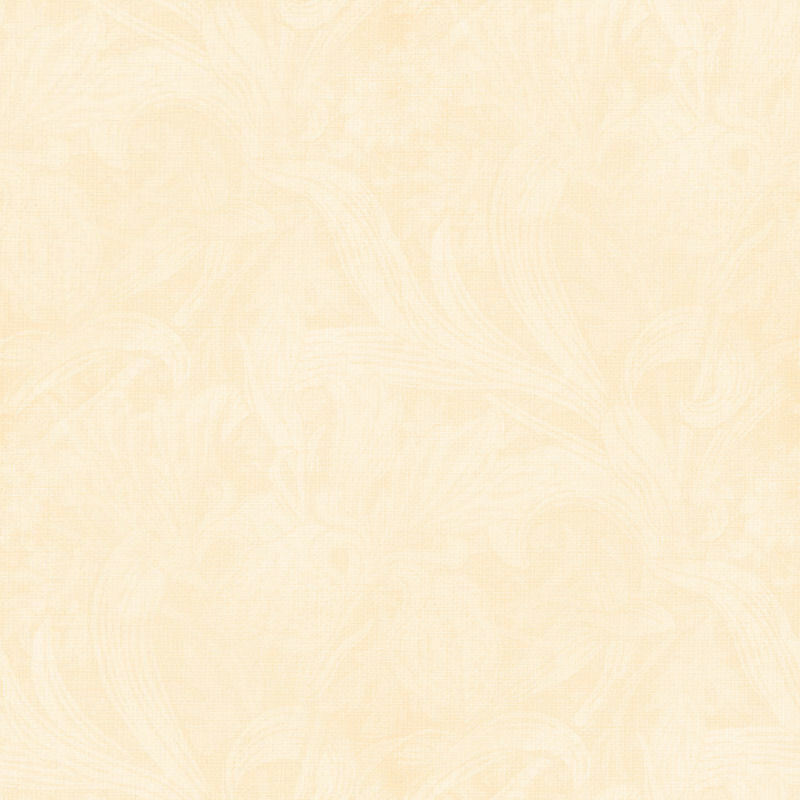 Do not remove this tutorial in any way from Ladyhawwk Designs.